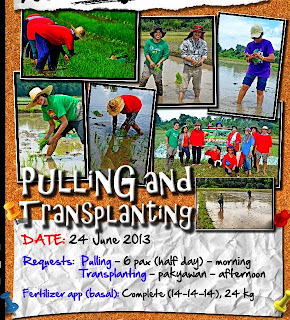 Team Tagumpay crams on transplanting day. This post originally appeared on Rochie's blog. The rain fell over the weekend, which caused some of the land preparation activities to be delayed. So when transplanting day, June 24, arrived, we were CRAMMING. The nice thing though, was that staff from the farm were on-call: if we needed help, they were there to assist; if we didn't need help, they would still stop by and make sure that we were alright. One has to have a strong throwing to fertilize this field. Once the field was fertilized, I joined Neale and learned how to correctly pull seedlings (without damaging the roots). That was scary! I didn't want my team's crop to die because I destroyed the roots! The people who were doing it routinely assured us that the plants were sturdier than they seemed. So we continued until it was time for lunch. 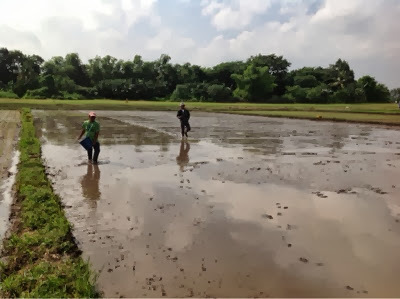 After lunch, Team Tagumpay had its turn in manually transplanting the crops, alongside the field workers. This was our very own "Magtanim ay 'di biro" moment caught on camera! Since we were the slowpokes, we were shooed from the field after an hour of attempting to plant rice. The field workers were so quick! Proof that we were in the field, planting, that day. Members of the team took rotating shifts to continuously watch over the field workers and make sure that they were planting seedlings in the right positions. Neale, RK, and Maya stayed while I went to a meeting. Then RK left to attend his meeting, with Maya returning to her own field. Once my meeting ended, I drove back to the field in time to get Neale and to fetch snacks; a technician then stopped by and watched over. When Neale and I got back, the technician was on his way out. While waiting for the field workers to finish, Neale and I grabbed the chance to try transplanting one more time. It's okay because we were muddy already anyway. Turned out that we just needed to learn the technique! At one point, we were transplanting at the same pace as the tired field workers! I emphasize on tired because they were slower at that point than when they began earlier in the afternoon. As the afternoon drew to a close, RK returned to see how our transplanting went. One thing's for certain, we were dirty and muddy but unbowed. In fact, we were happy when the transplanting ended! Team Tagumpay hunts for snails. NOTE: This post originally appeared in Rochie's blog. As the plants grew in the nursery (and I waited impatiently), it was time to think about land preparations in time for transplanting. 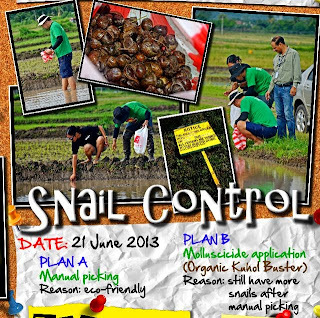 One of the tasks that Team Tagumpay had to agree upon was what to do with the snails. Maya, the team's environmentalist, was totally against the application of molluscicides to our team's plot (her words, not mine). 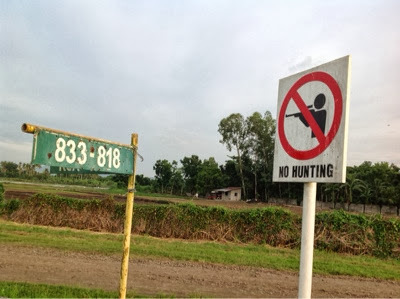 So on the morning of June 21, we came to the field armed with plastic bags to hunt snails even though hunting was not allowed... at least according to the sign. Hunting isn't allowed. Do snails count? At first, we didn't want to go into the flooded field. Gaye Cuerdo (of The Avengers team) captured photos of Team Tagumpay staying on the sidelines, literally, collecting only the snails close to the bunds. In the end though, the snails just kept going beyond our reach. We just had to jump in... BUT there were no more cameras to take our photos because everyone in the team was collecting snails. After a few hours, our snail collections filled a plastic bag. But there were still more snails to capture. 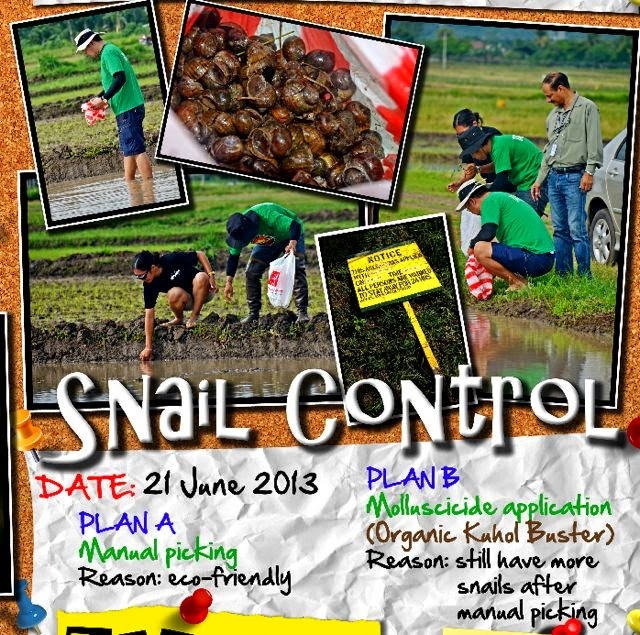 The team then agreed that it would be too risky to plant our rice seedlings in such a snail-infested field; so we ended up deciding to have the field treated with molluscicide. So what happened to the captives? We gave them to staff at the farm. We never saw the molluscs ever again. Sign up for Dry Season 2014!